Although mortality within a commercial flock can be financially significant a more pressing industrial concern is the ability of IBDV to cause immunosuppression. 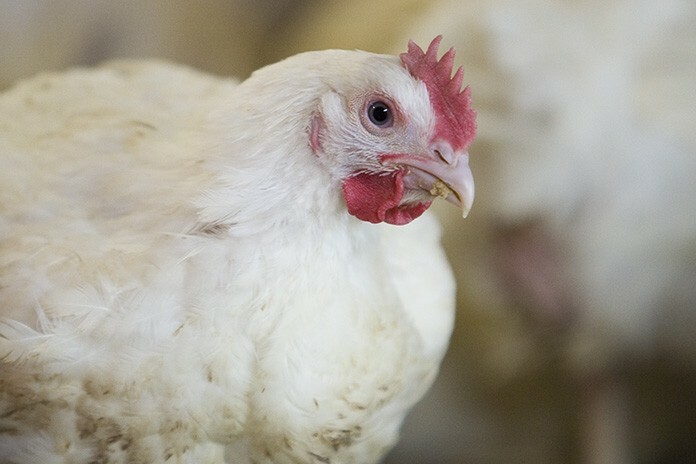 Despite vaccination programmes in place to protect commercial chickens, IBD remains a persistent and economically important condition where it infects both broilers and layers. A better understanding into the life cycle of IBDV has the great potential to inform the development of improved vaccines. In this current article the novel observation that IBDV causes global changes in genomic methylation of infected tissue is presented and the implications this finding has for preventing viral release and elevating immunosuppression is discussed. Avian B-cells produce antibodies against viral pathogens that help in the neutralisation of these infectious agents; in response viruses that infect birds often target immune cells to avoid elimination. In the context of poultry production, a flock of commercial fowl with a robust antibody repertoire and immune responses will have no or fewer incidences of infection and, as a consequence, a greater efficiency and profitability. One particular pathogen of veterinary and economic significance is infectious bursal disease virus (IBDV). An essential aspect of the IBDV life cycle is host cell death that mediates the release of viable viral particles that ultimately infect other birds. As IBDV targets developing B-cells, elimination of a significant pool of antibody producing cells within infected chickens dictates that survivors of a flock are often immunosuppressed. These birds are susceptible to future pathogen infections and respond poorly to vaccination regimes to protect flocks from other viral infections of economic importance including infectious bronchitis, Marek’s disease and Newcastle disease viruses as well as bacterial conditions such as chronic respiratory disease. Inactivated vaccines currently in commercial use against IBD are associated with certain disadvantages including neutralisation by maternal-derived antibodies. This has led to the use of more virulent live vaccines which have the inherent shortcoming of causing bursal damage. Given these known drawbacks there is a need for alternative vaccine strategies, one important step in designing novel or improved therapeutics against IBDV is a better understanding of cellular events that control the replication or infectivity of this virus including mechanisms that cause B-cell lyses in infected tissue. The bursa of Fabricius (BF), a gut associated lymphoid tissue, is both the primary site for B-cell development and the principle target of IBDV. This article will focus on cellular events within the BF with particular reference to global changes in genomic methylation. The mechanisms by which viruses modulate the immune system include changes in host genomic methylation. Cytosines within the genome not only constitute part of the genetic code, but are also amenable to chemical modification making them a central conveyer of additional information. Methylation of the fifth position of cytosine (5-methylcytosine, 5mC) is an evolutionarily conserved modification, which helps to maintain genome stability and acts as a suppressive mark for gene expression. It is becoming apparent that genomic DNA demethylation is more prevalent and dynamic than was previously appreciated. A mechanistic understanding of active DNA demethylation indicates the involvement of cytosine hydroxymethylation (5hmC). The Tet (Ten-11 translocation) proteins can convert 5mC to 5hmC making these enzymes pivotal players in events leading to complete cytosine demethylation. The finding that many tissues accumulate substantial 5hmC levels allows for the intriguing possibility that this cytosine modification is not only a transient intermediate leading to complete DNA demethylation but may also be an autonomous entity that carries its own unique properties and consequences. Recent reports suggest that 5hmC may impinge on cellular events including hallmarks of development and the pathogenesis of disease. In light of these findings, and given the predilection of IBDV for the BF, the series of studies by Ciccone and colleagues (1) presented herein investigated possible changes in 5hmC and 5mC patterns during the ontogeny of chicken B-cells within the developing BF and tested the hypothesis that IBDV infection disrupts genomic methylation patterns within this primary lymphoid organ. Animals and IBDV infection. Specific pathogen free (SPF), inbred line 0 or 15L chickens and either fertilized Rhode Island Red eggs containing viable embryos or neonatal chicks were obtained from the poultry production unit at The Pirbright Institute. For IBDV studies, an infectious dose of virulent UK661 IBDV strain or phosphate buffered saline (PBS) alone was administered per nares in a fifty microliter volume to six-week old chickens. Birds were culled 48 hours post infection (hpi). Immunofluorescence and bioimaging. Bursal tissues were sectioned using a cryostat (Leica CM1900) and fixed in 4% paraformaldehyde. Sections were then permeabilised in 1% Triton X100 and incubated at 37°C in HCl. To detect specific genomic cytosine modifications, antibodies raised against 5hmC (Active Motif) and 5mC (Diagenode) were used. An antibody (Southern Biotech) directed against the Bu-1 molecule was used to detect chicken B-cells. Secondary fluorescent antibodies, Alexa 568 goat anti-rabbit (Life Technologies) Alexa 488 goat anti-mouse (Life Technologies) were used to visualise primary antibody binding and images were captured using a Leica TCS SP5 confocal microscope (Leica Microsystems). Quantitative reverse transcriptase real-time PCR (qRT-PCR). 500ng of total BF RNA was reverse transcribed using superscript III (Life Technologies). One microliter of cDNA was mixed with platinum SYBR green reagent (Life Technologies) and used in a qRT-PCR assay, performed on an ABI 7900 96-well real-time thermocycler, to quantify relative amounts of cytosine modifying enzymes AID, Tet 1 and Tet 2. GAPDH was used as a reference gene and the ΔΔCt method of quantification was performed to obtain relative fold change to uninfected six-week old BF. Primer sequences for AID (forward: CCTGCGTAACAAGATGGGTTGCCATGTGGAG and reverse: CGGGCAGTGAAAATGCGGAGGGTCAAGT) and GAPDH (forward: GAAGCTTACTGGAATGGCTTTCC and reverse: CGGCAGGTCAGGTCAGGTCAACAA) were published previously. Probes directed against chicken Tet 1 (forward: AAAAGGAAGCGCTGTGAGAA and reverse: CCACGCCAGTATGAGAATCA) and Tet2 (forward: CGGTCCTAATGTGGCAGCTA and reverse: TGCCTTCTTTCCCAGTGTAGA) were designed based on chicken sequences from Ensembl (ENSGALG00000004073.4 and ENSGALT00000017236 respectively). A. Immunofluorescent staining of sections through embryonic day (ED) 16, ED18, one (D1) and seven days post hatch (D7) bursa of Fabricius. White dashed outlines delineate an individual follicle and arrows indicate epithelial structures. Scale bar = 100 µM. B. Dot blot assay using ten-fold dilutions of bursa genomic DNA from various developmental stages probed with an antibody directed to either 5hmC or 5mC. C. Real time analysis of cytosine modifying enzymes AID, Tet 1 and Tet 2 mRNA expression levels during the development of the bursa of Fabricius. n.s. = non-significant, *p>0.05, **p>0.01, *** p>0.005 as determined by ANOVA and post-hoc tests. n=4-5 birds per group. DNA dot blot. After proteinase K digestion BF DNA was phenol-chloroform extracted using standard protocols. One μg of DNA from each sample was serially diluted and denatured in boiling 0.4M NaOH. Samples, neutralised with an equal volume of chilled Tris-HCl (pH 6.8) were applied to a nitrocellulose membrane (GE Healthcare). DNA was then hybridized by ultraviolet crosslinking in a UV stratalinker 1800 (Stratagene) and the membrane was incubated at room temperature in 3% non-fat Milk (Bio-Rad) a dilution of anti-5hmC (Active Motif, La Hulpe, Belgium), or anti-5mC (Diagenode). Appropriate secondary antibodies (HRP conjugated donkey anti-rabbit or HRP conjugated donkey anti-mouse, Cell Signalling) were diluted in 3% non-fat Milk in TBS-Tween 20 and blots were incubated with agitation for one hour. Blots were visualized using ECL solution (Millipore) and exposed to X-ray film (GE Healthcare). Western Blot. Approximately twenty micrograms of BF tissue was placed in RIPA buffer (Sigma) supplemented with protease inhibitors (Roche) and disrupted using an automated tissue homogenizer (Biddy Scientific). Protein lysates were run on a 12% SDS-PAGE gel and transferred to a nitrocellulose membrane (GE Healthcare) using a semi-dry transfer unit (Bio-Rad). The blot was blocked in 3% non-fat milk before incubation with an antibody directed to the IBDV capsid protein VP2 (generated by the microbiological services of The Pirbright Institute). The blot was rinsed and a secondary HRP conjugated anti-mouse antibody (Sigma) was used for visualization using ECL solution (Millipore) and exposure to X-ray film (GE Healthcare). 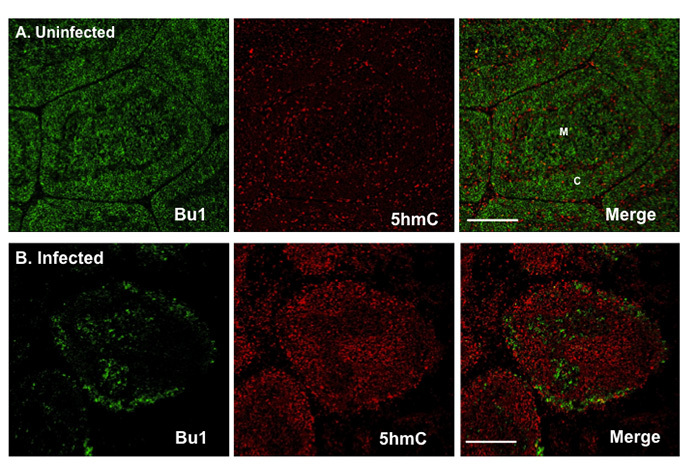 Using immunofluorescence techniques potential changes in BF 5mC and 5hmC genomic distribution at different embryonic and neonatal stages that encompass hallmarks of chicken B-cell development were determined. At embryonic day (ED) 16, the BF had a relatively uniform distribution of both 5mC and 5hmC, although more intense 5hmC staining was consistently observed within the epithelial layers of the bursa (Figure 1; arrows). This 5hmC enrichment becomes more apparent at successive stages of embryonic development when B-cell progressively colonise the BF and individual follicles can be definitively identified (dashed white outline) and become surrounded by a follicle-associated epithelium (Figure 1A). Associated with high 5mC levels in developing follicles (Figure 1A; dashed white outline) is a progressive developmental loss of 5hmC staining. 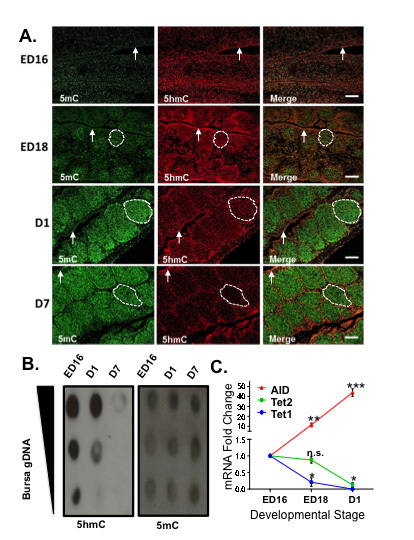 This observed 5hmC reduction in bursal tissue sections was validated by a dot blot assay (Figure 1B), which shows a progressive reduction in genomic 5hmC from ED16 to seven days post-hatch (D7). Immunofluorescent staining of bursal sections of an embryonic day (ED) 18 chick showing the co-localisation of either A. 5mC or B. 5hmC with the avian B-cell marker, Bu-1. Dashed outlined area delineates a single B-cell containing bursal follicle. Bar = 100 µM. To confirm that the proliferating follicles did contain B-cells co-stained ED18 bursal sections with Bu-1, an avian B-cell marker, and either an antibody directed to 5mC or 5hmC were examined. 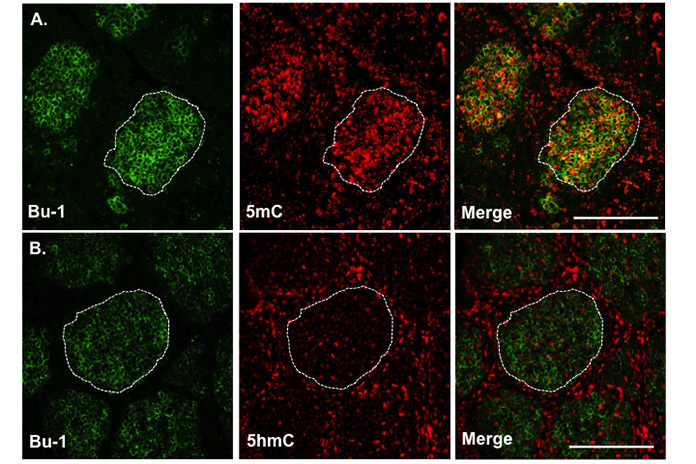 The results show that Bu-1 only stained cells within each follicle and the majority of these B-cells were also highly enriched for 5mC (Figure 2A). Furthermore, we observed that the B-cell genome contained relatively low levels of 5hmC compared to the surrounding bursal epithelial layers (Figure 2B). A possible explanation for a highly 5mC enriched B-cell genome at a relatively early stage of embryonic development is the cellular implications associated with the generation of a diverse antibody repertoire. Genomic 5mC may provide protection from the mutagenic activity of the B-cell antibody diversifying enzyme activation induced deaminase (AID) at off target genomic sites. In support of this view, AID requires access to cytosine nucleotides to generate mutations within immunoglobulin variable regions that culminate in antibody diversity (ref) and AID mRNA increases significantly within the developing bursa from embryonic to post hatch stages while mRNAs that encode Tet family members 1 and 2 reduce over the same period (Figure 1C). This reduction in Tet transcripts may explain the reduction in 5hmC levels within the developing B-cell (Figure 1A). Immunofluorescent staining of bursal sections from either control or IBDV infected (48 h.p.i.) 6-week old chickens showing co-localisation of 5hmC with the avian B-cell marker, Bu-1. M= Medulla; C= Cortex. Bar = 100 µM. Infection of six-week-old chickens with a dose of a virulent IBDV strain, UK661, caused a significant reduction in chicken B-cell marker Bu-1 within the bursa (Figure 3). Associated with this loss of Bu-1 was a global increase in immunostaining of 5hmC levels when compared to uninfected, age-matched controls (Figure 3). Analysis of Tet 1 and 2 mRNAs by real time PCR revealed a significant increase in both transcripts within the bursa after IBDV infection (48 h.p.i) when compared to uninfected birds (Figure 4) suggesting that increased Tet expression may be part of a mechanism involved in increased 5hmC in diseased BF. A. Western blot analysis indicating that the capsid protein of IBDV, VP2, is present in both bursa and spleen of six-week old chickens infected with IBDV (48 h.p.i) but not in uninfected birds. B. Relative expression of Tet 1 and Tet 2 mRNAs following IBDV infection (48 h.p.i) within the bursa of Fabricius. Bars are mean ± SEM. * indicates statistical significance at the p>0.05 level between uninfected and 48 h.p.i. birds for the same gene as determined by unpaired t-test. n= 3 birds per group. In conclusion, Ciccone et al. (1) have documented that global 5hmC and 5mC genomic levels display temporal changes during the development of B-cells within the BF. Moreover, the chicken embryonic B-cell has high levels of genomic methylation that may protect from the disruptive activity of the cytosine modifying enzyme, AID. IBDV infection causes immunosuppression through loss of B-cells and this data suggests that the underlying mechanisms may include disruption to genomic methylation patterns of the BF and an increase in global 5hmC genomic levels. This increase in 5hmC within infected host tissues may be part of a hitherto unrecognised mechanism by which IBDV can cause genomic instability and cell death to facilitate viral egress. This is the first documented example that a viral infection can cause global increases in genomic 5hmC and novel therapeutics that block this genomic modification has the potential to reduce IBDV infections within a commercial chicken flock. Ciccone, N.A., Mwangi, W., Ruzov, A., Smith, L.P., Butter, C., Nair, V. (2014). A B cell targeting virus disrupts potentially protective genomic methylation patterns in lymphoid tissue by increasing global 5-hydroxymethylcytosine levels. Vet Res. 45:108. Essential oils – Opportunities to improve food safety in organic poultry production and processing.